April sunshine and longer days herald that the spring season is here! With the coming of this new season, so too comes spring cleaning … those inevitable chores that derive from the need to freshen our homes after many cold months indoors. Spring cleaning might be an annual rite of passage and minor inconvenience for many of us, but it can be an especially daunting task for our senior loved ones. As our family members, neighbors, or friends age, they are more likely to need help with spring cleaning chores. In fact, spring cleaning offers a wonderful opportunity to reengage with our senior loved ones. Not only can we support the ones we love, but spring cleaning also provides insight into our loved ones’ safety and needs. 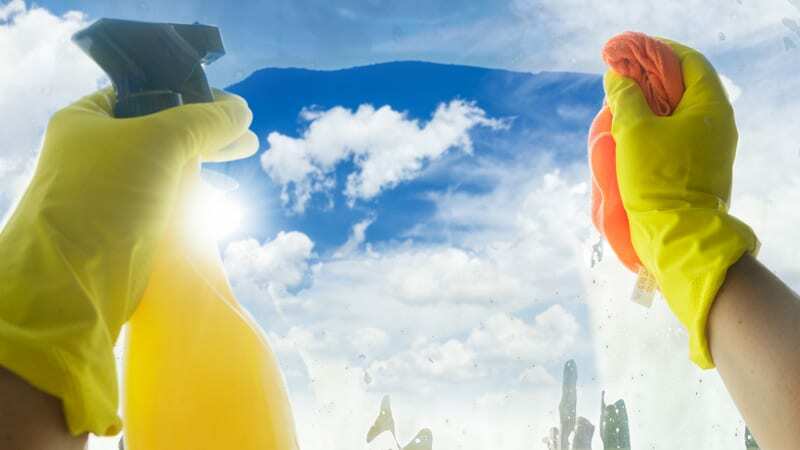 If you have a loved one who needs help with spring cleaning, the best place to start is by picking a day to dedicate to those springtime chores. Remember that you’ll be at their home, so let them take the lead and provide gentle guidance on identifying the scope of cleaning and where you can help. Like all of us, seniors derive satisfaction from contributing to a family effort. They don’t want to watch everyone else clean while they sit around. Decluttering: Organizing and removing clutter is a crucial spring cleaning task. Seniors can assist with decluttering their items. They also can assist with organizing lightweight items, such as paper and jewelry. Medicine Cabinets: Removing expired medication should be at the top of all cleaning lists. Seniors can help by identifying expired medicine and collecting it for disposal. If your loved one has trouble standing or walking, simply empty the medicine cabinet on a dining room table so they can sit and organize. Silverware: Polishing silverware is another great cleaning task that can be completed at a dining room or kitchen table. Dusting: Dusting can be a low impact task as long as your loved one focuses on areas that don’t require lots of bending. Here’s a fun tip: partner your loved one with a grandchild. They can focus on the tops of tables, chairs, and furniture while their grandchild focuses on the legs and lower spaces. They can be a team and have fun together! Clothes: Sorting through clothes is perfect for spring cleaning and allows your loved one to better manage their wardrobe. Loose clothing or sudden weigh loss can indicate that they are missing meals. Soiled or dirty clothing can indicate that laundry is too difficult or they are forgetting to do it. Spoiled food in the fridge can indicate issues with vision, smell, or memory loss. The house is much messier than usual, including overflowing trash, dishes piled in the sink, and grim in the bathroom. These indicators could mean that maintaining the home is increasingly difficult. Another common sign you might discover during spring cleaning are hoarding tendencies. Known as late-life hoarding disorder, it is not uncommon among seniors. According the American Geriatrics Society, living alone for long periods of time can be a catalyst for hoarding by seniors. A John Hopkins University study found that 6.2 percent of individuals over 55 display hoarding behavior compared to only four percent of the entire population. Senior hoarding is a serious warning sign because it is often the result of self-neglect, social withdrawal, apathy, or cognitive impairment. It should be a clear indication that your loved one needs help. Use spring cleaning time to thoughtfully and carefully evaluate your loved ones’ home to see if any of these warning signs or hoarding tendencies are present. If you recognize any of these signs or that home might not be safe, you should pursue options to provide additional support for your loved one or identify a living environment where they can thrive safely. Spring cleaning is an ideal time to show a loved one that you care and take a closer look at their home to ensure they are happy and safe. Commonwealth Senior Living is an award-winning assisted living and memory care provider with two communities in the Greater Richmond area, located in Henrico County’s West End and North Chesterfield County. For more information on the communities and resources for caregivers, visit www.commonwealthsl.com.